Home / Sports / SPORTS: BREAKING!! UEFA Charges Celtic After Fan Runs Onto Pitch To Attack PSG Star Mbappe. SPORTS: BREAKING!! 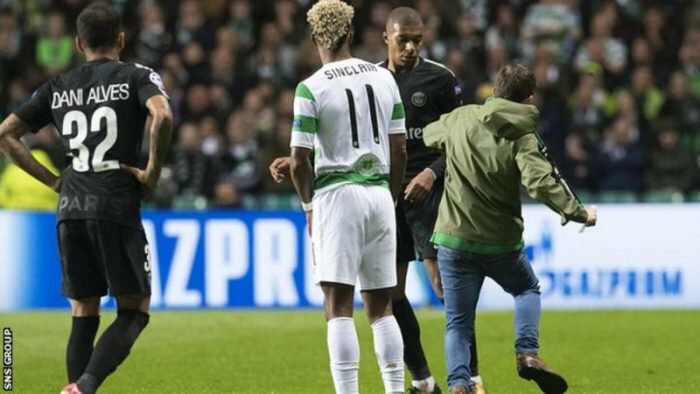 UEFA Charges Celtic After Fan Runs Onto Pitch To Attack PSG Star Mbappe. Celtic have been charged by Uefa after a fan ran on to the pitch and appeared to aim a kick at Paris St-Germain striker Kylian Mbappe. The incident happened late in the first half of Tuesday’s Champions League match at Celtic Park, shortly after the visitors’ third goal in a 5-0 win. The case will be dealt with by Uefa’s control, ethics and disciplinary body on 19 October. “It was bitterly disappointing and I am sure the club will deal with whoever that supporter was. It shouldn’t be anything that we should see. In July, Celtic were fined £20,600 after an “illicit banner” was displayed during their qualifying win over Linfield. It was the club’s 11th punishment in six years relating to misconduct from supporters during European ties. Following the initial charge, they announced a two-game closure of the area of the stadium occupied by the Green Brigade fans’ group.